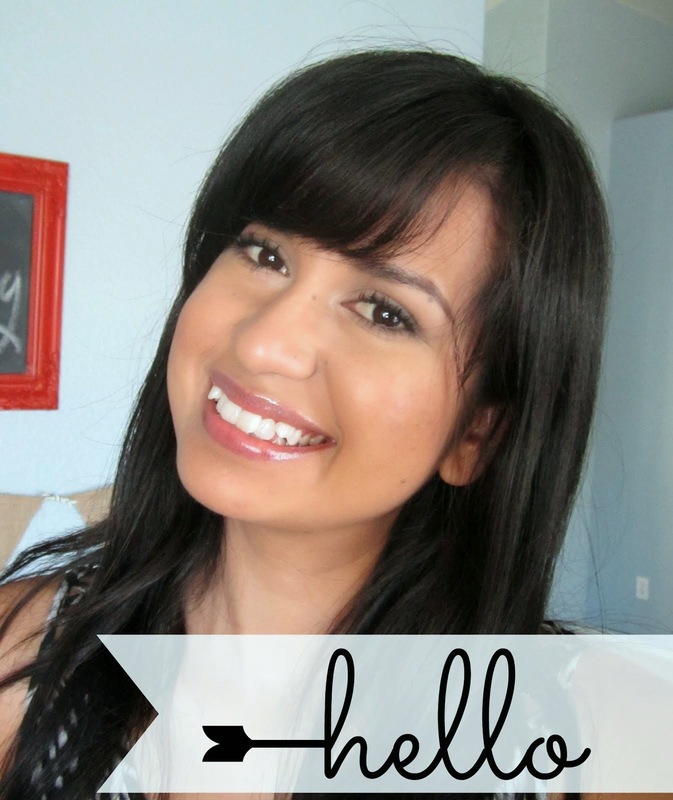 After a two month blogging break I am so excited to finally be back!!!! Although I must admit, I feel like a newbie all over again! You should have seen me trying to edit my photos on PicMonkey. You'd think I'd remember the flow of things...but nope. I also want to let you guys know that I will only be posting once (maybe twice) a week until I get a new laptop. Mine is incredibly slow and I'm sure it takes me twice as long to blog than it should. During the summer I saw this amazingly easy project over at Landee See Landee Do, and so it happened that Selene saw and Selene did. 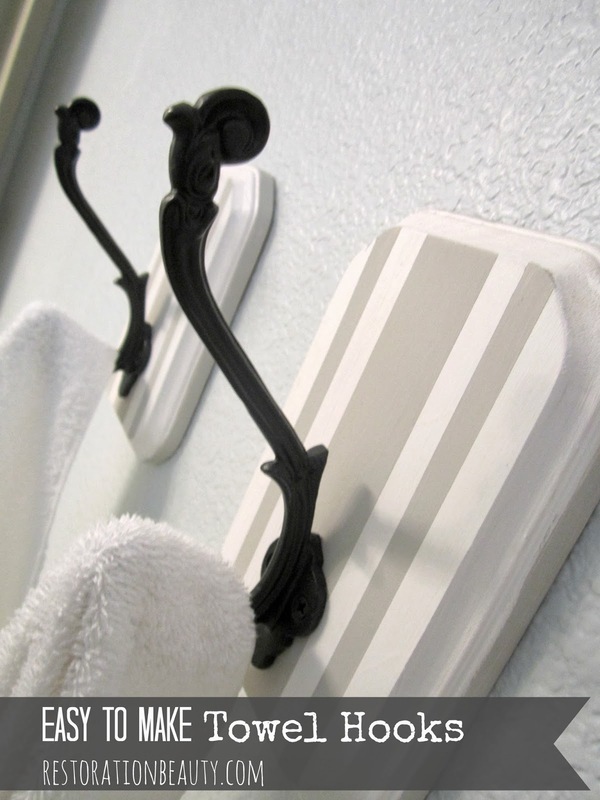 How could I pass this fabulous alternative to the plain ol' towel bar??? 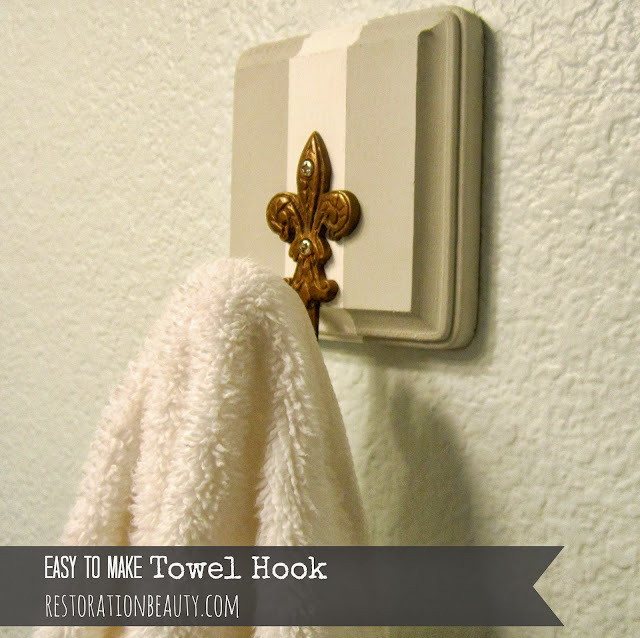 I love how these towel hooks look with my DIY'd Floor to Ceiling Shower Curtain too! These DIY towel hooks are so easy and fun to make! I purchased a couple wooden plaques from Hobby Lobby, painted them white and added gray stripes with a sample of Martha Stewart's Nimbus Cloud. Then I drilled these fabulous black hooks (also found in Hobby Lobby), added four Command strips to the backside, pressed them to the wall and threw the towels on! I didn't think the Command strips would hold up the weight of the towels (especially when wet) but so far so good! It's been a few months and I haven't had any issues. You can check out the tutorial here, if you'd like! My favorite part is that I don't have to fold the towels and make sure they're even anymore. Now I just throw the towel back on the hook and forget it! Thanks, Lena! And I agree, they are fun! Had to Pin this! Definitely gonna do this project. Hi Nikita! Thanks a bunch for stopping by and pinning! Let me know how yours turns out! 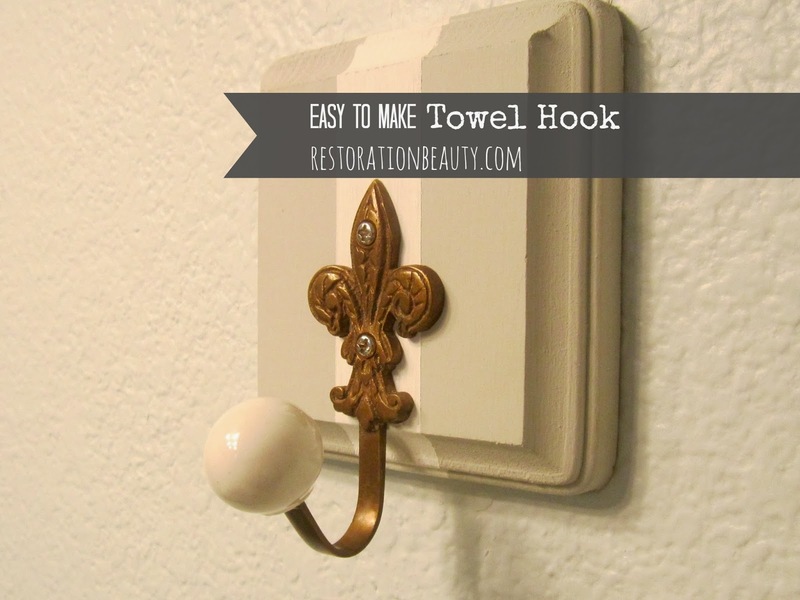 Redoing my bathroom and this is one thing I am changing, already have two new hooks! How fun! 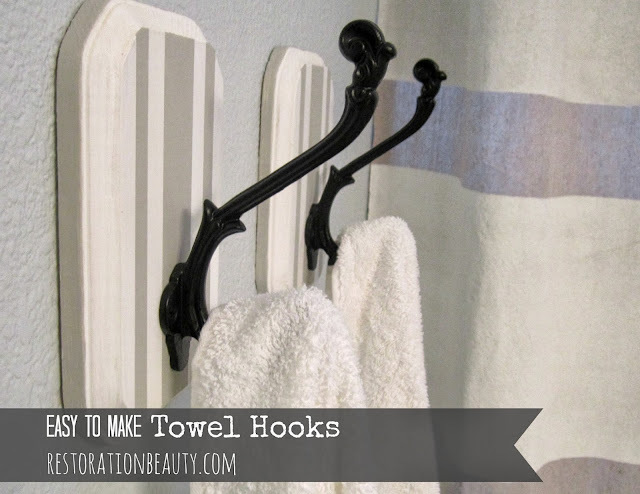 So glad to hear that you will incorporate the towel hooks! What cute project Selene! Thanks for sharing! And welcome back! Loving the slightly beachy look! Perfect for all those wet towels and dirty clothes in the bathroom! Thanks, Lindsey! Now that you mention it, I do find myself throwing my daughter's clothes on them! Lisa, you are too sweet! Thanks for the nice warm welcome! Thank you Kim! I agree, these hooks are way cuter! These are so cute Selene - I love the character that mounting them on the board adds as opposed to just the wall. And what pretty hooks! 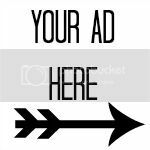 easy and awesome DIY - thanks for sharing!! Well, thank you Vett! And thanks for visiting, you're welcome over anytime! Love how you put yours on wood, it really adds a nice look to them. 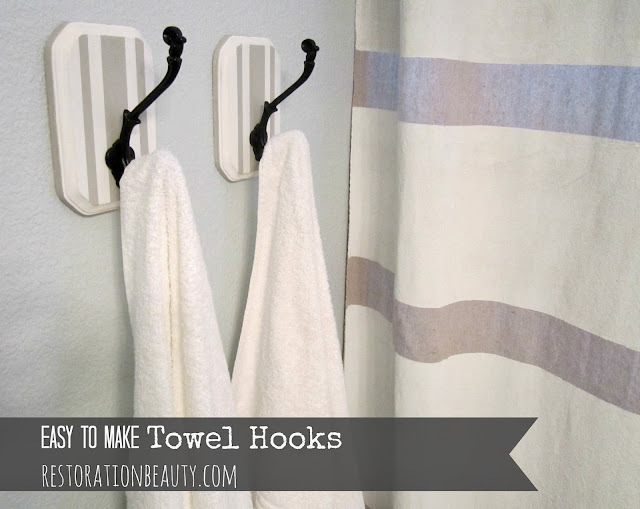 I actually have those exact hooks on the back of my bathroom door to hold towels. Love them! Thanks so much for stopping by chapter37 and for your kind comment! Thanks so much, Abby! Those hooks are so pretty, aren't they? Glad you like it Rhonda! And thanks for pinning! Thanks so much, Miranda! That's so sweet of you! Great Idea! I need a few of these hanging up in my kids bathroom. What a way to come back, love this idea! Thanks for sharing on the weekend re-Treat link party! Thank you, Britini!! I knew I had to try the project when I saw it!! I love these! You did a great job. So happy to see that you're back. I've missed your awesome projects. I am featuring you today at Pick of the Bunch! Have a wonderful weekend. Aww..thanks Kathy!! I'm glad you lobed them too!! 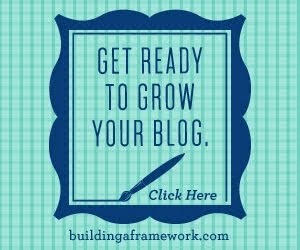 Have subscribed to your blog and pinning this. Thanks! Glad you liked them and pinned them :) Have a great day!